When a tornado or severe thunderstorms warning is issued for your county or parish, do you wonder if your neighborhood is in the storm's path? Now you can know with WeatherCall. It is a service offered by NBC 6 that delivers precision severe storm warnings to your telephone, 24 hours a day. Many counties in the ArkLaTex viewing area are a thousand square miles. Dangerous storms are often less than 200 square miles. In the past, severe weather warnings were issued for entire counties creating uncertainty as to exactly where the threat really is. The National Weather Service now uses a new and much more precise method to define a warning area called STORM-BASED WARNINGS that reduces the size of a warning area by an average of 75%. The image below illustrate how WeatherCall will reduce the chance of your being warned unnecessarily. WeatherCall combines this new method to determine a warning area with robust emergency telephone notification. Using computerized mapping, WeatherCall matches the danger area defined by the National Weather Service with your exact street address. 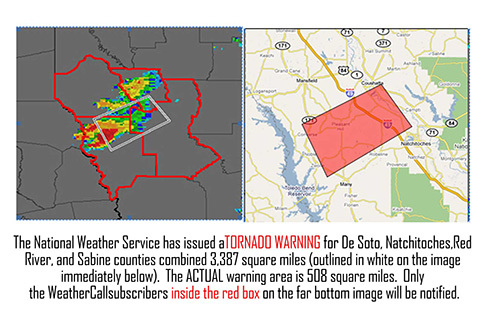 If your address is within the danger area of the weather warning, Meteorologist Todd Warren will deliver the warning message to the phone numbers you register, and also send you an email if you provide one. WeatherCall can also alert you to severe weather no matter your location. WeatherCall To Go will alert you based on the location of your smartphone. That means that you can be on top of threatning weather even while on vacation. Have a child that participates in outdoor sports? WeatherCall can even alert you when dangerous lightning is nearby and when that threat subsides. CLICK HERE TO SIGN UP! !